Here's to Hopping! : Newburgh Brewing Company's "Sterk Ale Von Hoodie"
Here's the last review in my three part review of Newburgh Brewing Company beers. 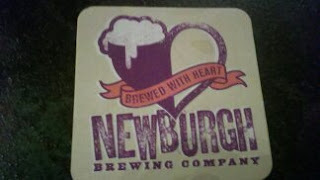 All 3 beers are part of their "Brewed With Heart" series of beers. The"Brewed With Heart" beers are small, usually single batch beers that are availabl for a limited time. They're not part of their year-round rotation. However, it seems as though the "Brewed With Heart" series sometimes has an influence on what the brewery may put in their year round rotation. Recently, a post from Newburgh Brewing on facebooks stated that their Madura-Menditto Harvest Ale was such a hit that they're brewing a new whole cone hopped Pale Ale that might become part of their seasonal rotation. One can only hope that this is the case, because the harvest ale was off the damn hook good! An excellent american pale! Anyway, so here's the review of their "Sterk Ale Von Hoodie" Belgian Strong Ale. Enjoy! Appearance: Beautifule godlden hues, with not much of a head. Razor thin creamy white head. Decent amount of lacing on the glass despite the absence of a defined head, and the lacing sticks fairly firmly to the glass. Aroma: Definitely getting a lot of spice on the nose. Predominantly clove aromas, followed by nutmeg and brown sugary notes. Taste/Mouthfeel: Medium bodied with moderate amounts of carbonation. Spicey notes (mainly clove, pepper) dominant the initial tasting, whoch slowly gives way to a molasses/brown sugar sweetness. The finish consists of the brown sugary sweetness followed by a small, insignificant bite from the alcohol. However, you hardly notice it, making this beer incredible drinkable, and dangerous with it's 10.2% ABV. Overall: 10 out of 10. I loved this. I am a huge fan of Belgian Strongs, but at times I feel like the spice notes become a bit too much. In this brew the spice notes aren't overpowering, and the sweetness of the malts are allowed to shine through to the finish. A completely enjoyable ale that will keep you warm on those cold winter nights. This is, hands down, my favorite beer from Newburgh at this moment. So remember, it's part of their "Brewed With Heart" series of beers, which means it won't be around long. So, the next time you're looking to warm yourself up on a cold winter's night, get down to the brewery on Colden St. in Newburgh and allow this beer to wrap it's warm arms around your frigid flesh! Cheers!